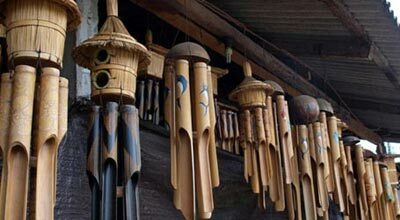 Wind chimes have a long and varied history, with developments spanning cultures, continents and uses. Archeological finds date back almost 5000 years. 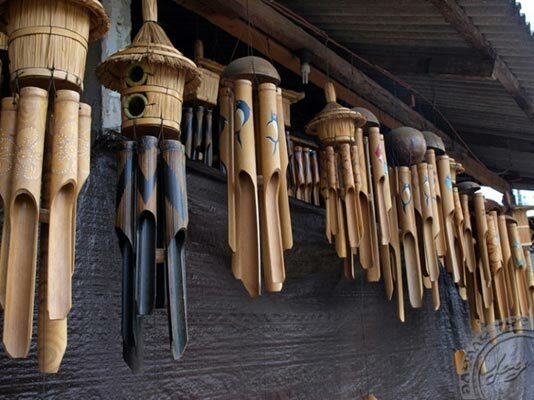 In South East Asia remains of wind chimes made from bone, wood, bamboo and shells were found about 3000 BC. Chimes were thought to ward off evil spirits. A more practical use in Indonesia was to scare birds from crops. In 1100 BC, the Chinese were the first to appreciate the musical and artistic properties of wind chimes and bells. The Chinese developed the art of bell sounding and metal bells were hung from eaves in temples and pagodas to ward off evil spirits. They were also used as warning signals when the uncontrollable forces of nature were about to impact the environment, e.g typhoons, tsunamis. The Chinese used the music of chimes to express emotions and establish an atmosphere of peace and harmony. Buddhists liked to hang hundreds or even thousands of wind chimes or bells on temples, shrines and pagodas. Causing during breezy moments an almost overwhelming auspicious sensation of sound. In the 1800's wind chimes spread from China to Japan and then the western world. The soothing tones of windchimes echoed the music of the breeze, creating a meditative atmosphere of peace and calm. Listening to the sound of windchimes creates a state of balance, relief, serenity and peace. Wind chimes change moods and atmosphere. They inspire peace and harmony in our busy lives, calming, relaxing and healing.